Trevor Andrews Racing :: Minor Procedure Gets River Running. Consistent galloper The River is poised to make a strong return to racing in Saturday’s Amelia Park Lodge Sprint (1000m) at Belmont, after overcoming a minor setback since his last start win in December. The four-year-old won his only two starts last campaign, and showed an electric turn of foot on both occasions to come from midfield to win. However, after his last win trainer Trevor Andrews had to send the gelding for minor surgery, but said it wouldn’t prevent him returning to his best form this campaign. “After his last run we gave him a little break,” Andrews said. “He had a chip on the pastern bone which needed minor surgery. 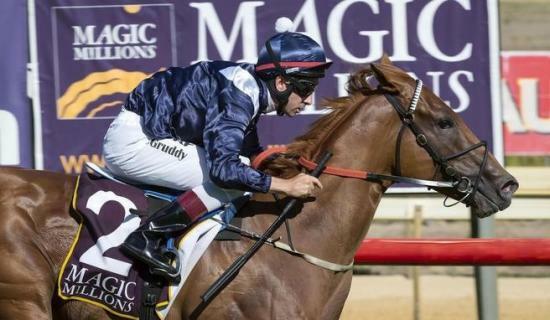 Andrews described The River’s trial on July 9 when fifth to Chinetti as “pleasing”, but felt it would be a good test carrying 59kg from barrier seven on Saturday. The River will also face stiff opposition on his return to the track, in particular the Chris Gangemi-trained Floyd, who finished second at his first start this campaign. Andrews said The River would have a short campaign into the new season, before again targeting races over the Ascot carnival. It is expected The River will run in the $100,000 New Season Sprint (1000m) on August 4, prior to the Listed Belmont Newmarket (1200m) on August 18. “Whatever he does on Saturday he will improve on next start,” Andrews said. Andrews also has Outlaw Pete engaged in the Schweppes Handicap (2200m) on Saturday, where he has drawn barrier 10. “He’s been luckless with barriers,” Andrews said. Meanwhile, two of Andrews up and coming fillies returned to work this week, with two-year-old Princess Pierro and three-year-old Private Dancer both targeting feature races over the Ascot carnival. “Princess Pierro will head to the Champion Fillies Stakes,” he said. Saturday’s Belmont program gets underway at 12.43pm, with The River’s race to commence at 2.03pm.